Save more than just petrol with a new Honda scooter. If getting around town on something small and nimble sounds like the perfect way to beat traffic, then drop into a Honda Dealer now to take advantage of their current Honda Dollars deal on the entire range of scooters. From the smaller end of the scale including the Scoopy, Today 50, Lead100 and SHi150, right up to larger models such as the Forza 250, SHi300, Silver Wing 400 and Silver Wing 600, each model comes with $250 Honda Dollars, regardless of the ticketed price. Honda Dollars can be used in the Dealership at the time of the transaction on a wide variety of accessories such as helmet, gloves and jacket, for servicing or as a credit toward the scooter purchased. Every Honda scooter is powered by a reliable, fuel efficient four-stroke engine and silky smooth V-Matic automatic transmission with electric start, whilst offering excellent ergonomics for rider comfort and spacious storage capacity to hold a briefcase, books or other personal items. 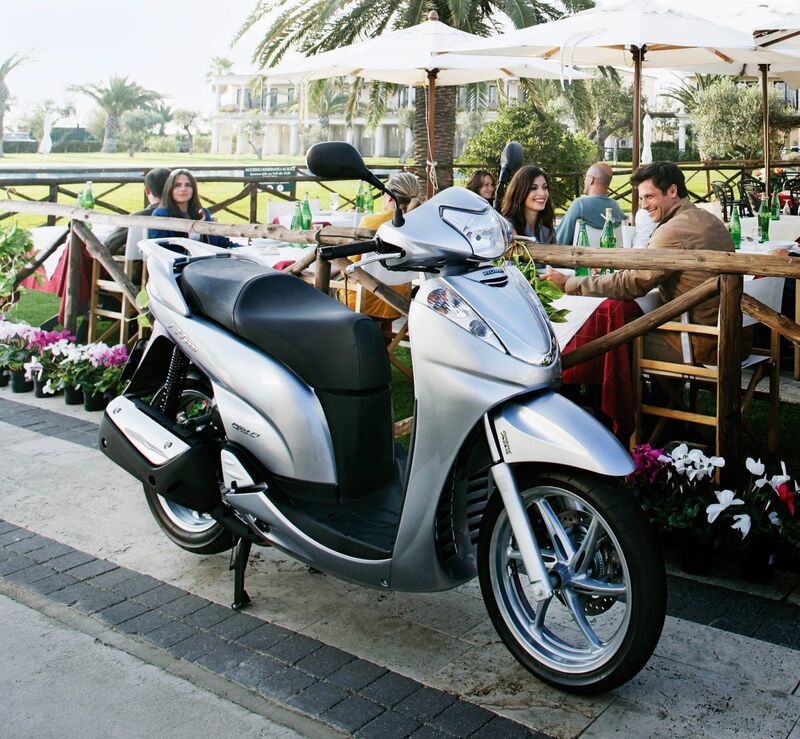 With their efficient, clean, green design, Honda scooters provide the perfect solution to many of the environmental and transport issues that affect most commuters every day. Honda Dollars are available on each model from October 1 to December 31, 2009. Filed under: Save more than just petrol with a new Honda scooter. –VACC Executive Director David Purchase. Melbourne, and larger provincial towns, should have a sign-posted system of designated ‘Safe Routes’ for scooter riders, linking CBD and suburbs. These routes should be clearly identified and promoted. They should feature special traffic management features designed to encourage their use and to make scooter-commuting as safe as it can possibly be. VACC also calls for a public education campaign to encourage car drivers to be more alert and aware of bicycle, scooter, and motorcycle riders. VACC recommends that motorcycle safety boxes be placed at the head of busy intersections (the safest place for motorcycle or scooter riders is at the head of stopped traffic). To access safety boxes, VACC recommends that filtering be permitted (and encouraged) to the left and right of stationery or slow-moving vehicles. VACC recommends that scooters (and mopeds) be permitted to share certain bicycle lanes on certain SAFE ROUTES (but limited to 35kp/h speed limit within these lanes). They are two of the most eagerly-awaited model releases of the year and Kymco is pleased to announce that the Sento 50 and Super 8 125 are now here. These two models are the first of a host of new model introductions from Kymco over late 2009 and early 2010. On the back of the company’s recent launch of its road bike range, the Sento 50 and Super 8 125 add an entirely new dimension to the Kymco scooter range. 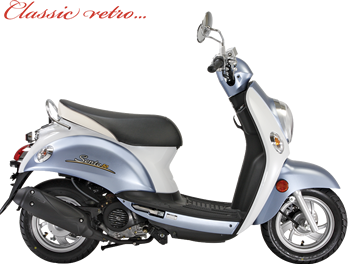 The Sento 50 boasts a classic European retro style with a two-tone paint scheme and seat to match, slick alloy wheels and clear indicator lenses. This unique looking scooter is a guaranteed head-turner, whether you choose the pastel pink, pastel blue or black colour scheme. The low seat height on the Sento makes hopping on and off easier than ever, while the under seat ignition code lock security system controls the locking of the storage compartment, fuel filler cap, steering lock and ignition system. There’s also a side stand for convenience, a centre stand for ‘proper’ parking and a handy shopping bag hook. The performance of the Sento’s highly fuel-efficient 4-stroke engine caps off this impressive package, along with a front disc brake with twin-piston caliper, the option of electric or kick starting and pop out pillion foot pegs. Equally as impressive is the all-new Super 8 125. 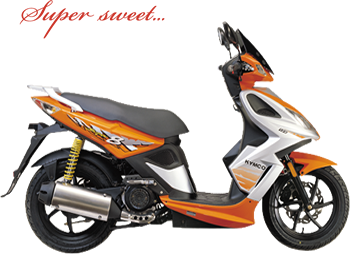 With modern sports styling, vibrant colours and a powerful 4-stroke Kymco engine, wherever you go, you’ll be going in style. The Super 8 125 boasts 14 inch alloy wheels and twin shock absorbers for a smooth, comfortable ride, while the large 240mm diameter ‘wave’ front disc brakes make stopping easier than ever. This air-cooled machine also offers both electric and kick starting, locking under seat storage, clear indicator lenses, ergonomic levers and hand grips and a sport screen. The Super 8 125 is available in lime green/black, orange/silver or ruby red/black. Established in 1963, Kymco is one of the world’s largest manufacturers of power driven products, and has long been a dominant player in the Australian scooter market. The company manufactured over 570,000 vehicles last year, which means that every 55 seconds, someone somewhere in the world was purchasing a Kymco vehicle. In fact, Kymco has produced over 4.5 million scooters, ATVs and motorcycles in the past decade alone, increasing volume by 36 per cent since 1999. And backing up Kymco’s world renowned product quality is the fact it has been awarded ISO 9001 – the world manufacturing quality assurance rating. The company has forged strong relationships with the global scooter and motorcycle industry, manufacturing components for other brands such as the G450X enduro engine for BMW. On the back of its outstanding market share result in August, the newest entrant to the Australian ATV market – Kymco Australia & New Zealand – today announced a special offer on its MXU 250 and MXU 300 to whet the appetites of farmers around the country. Until 30th November 2009, the MXU 300 will retail for $5,990 ride away (a saving of $500 on RRP), while the MXU 250 will be selling for the unbelievably low price of $4,990 ride away (a saving of $1,000 on RRP). In only its third official month of trading in the Australian ATV market, Kymco posted 3.2% market share in August to cap off a successful launch to the Australian market. Following in the footsteps of the award-winning Kymco MXU 250, the versatile MXU 300 has been designed to better meet the needs of Australian farmers - and for a price at least $1,000 cheaper than most competitive Japanese and American models. The MXU 300 is further evidence of the legendary Kymco build quality, powered by a 270cc, 4- stroke, liquid-cooled engine which has been highly-acclaimed across the globe for its low maintenance and trouble free operation. This robust machine boasts automatic CVT transmission with High/Low range, a whopping 25cm ground clearance, braided steel brake lines and standard skid plates and a brushguard for extra protection. There’s strong low-end torque and smooth controllable power thanks to the smooth-shifting automatic transmission. The utility of the MXU 300 is also incredible, with a towing capacity of 227kg and front and rear racks coming standard with a combined capacity of over 50kg. Disc brakes at the front and rear make handling and stopping sure and reliable, while the handlebar-mounted backlit digital dash lets the rider monitor speed, mileage, time, lights, gear selection, engine temperature and fuel levels at a glance. The MXU 250 is a past winner of ATV Magazine’s People’s Choice Award for Best New Product and is the ATV of choice for thousands of buyers around the world. At the heart of this machine is the 4-stroke, liquid-cooled, 249cc engine, which delivers strong performance and makes the ride user-friendly for all terrain. The engine also has electric start and recoil back-up for convenience. And not only is the MXU 250 a robust farming machine, it also comes with the necessary bells and whistles too. The digital instrumentation on the MXU 250 includes speedo, trip meter, a clock, engine temperature level and fuel gauge.The MXU 250 features wide fenders and full floorboards to offer protection from water, mud or sticks, while it is also equipped with a heavy duty front bumper as standard for extra protection. Capping off this impressive package is the famous Kymco automatic CVT transmission for the ultimate ease-of-operation. We have a huge morning arranged for this year’s Spring Has Sprung Scooter Run. 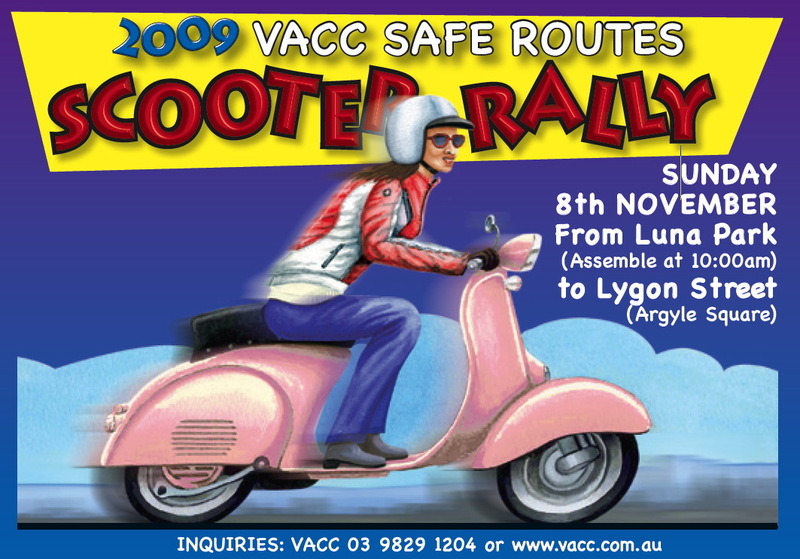 The ride is September 20 2009, and we will be here at Scooter Central (551 Pittwater Rd, Brookvale, Sydney) from 830 am. 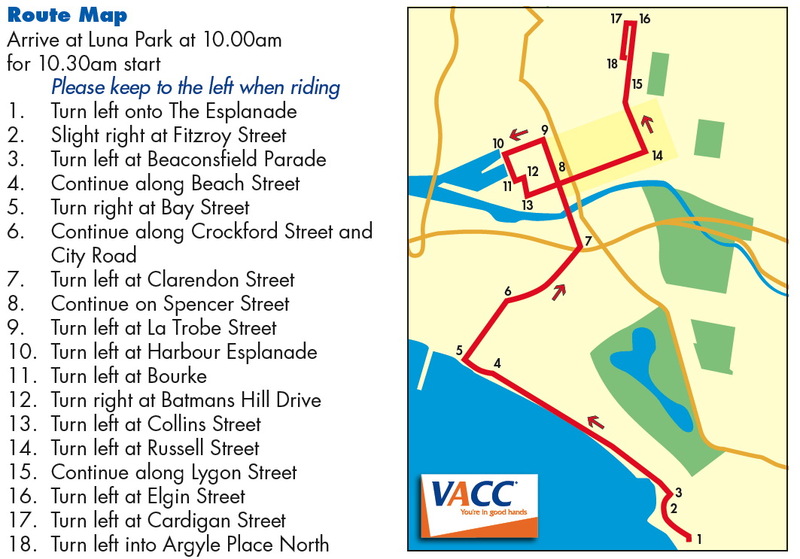 The ride area will only be around the beaches, so its open to all capacities of scooters from 50cc. As usual, the ride is open to anyone and everyone, so even if you've never done a ride before, come along and give it a try. Also feel free to bring along a friend as pillion for a fun day. The ride briefing will be at about 9:15am, but cappuccinos, tea and hot chocolate will be available for all from 830am, along with plenty of chat Im sure. The format will consist of a team’s event. Each team of 5 or 6 riders will be given an envelope that will contain a clue as to how to get to the next stop and receive another clue. There's no need to form a team, as well sort it out on the morning. At each of the stops each team will be required to collect an item and the next clue. This will test the group’s navigation and resourcefulness. There will be 4 sets of clues, and the last clue will let you know where we will be stopping for lunchtime BBQ. There is no need to bring anything, as the BBQ and drinks will be supplied by Scooter Central. Prizes will be awarded for the team that supplies all of the items and arrives at the final venue without cheating too much. We may also sneak in the first "Annual Intergalactic Slow Race" at the BBQ site. The slow race is a heap of fun, and the winner will be the rider who can complete the course in the slowest time without putting their feet on the ground. Prizes will be awarded in different categories, so start practicing riding as slowly as possible about 10-15 metres. Vespa Injects more into iconic range! Vespa has completed the fuel injection revolution across its entire range of 125cc to 300cc scooters. The LX125, LX 150 and S 125 now share Piaggio’s own sophisticated fuel injection system that optimises engine performance for lower fuel consumption and lower emissions and exceeds Europe’s strict Euro 3 emission rules. Vespa owners will enjoy immediate gratification with smoother operation, easier starting and improved performance. The classic steel bodied LX range has also received some small but significant styling changes. The cool retro styling of the S 50 and S 125 models released only last year, remains unchanged. Vespa is introducing the LX125ie and S 125ie models at $5690 MLP and the LX150ie at $5990 MLP. Filed under: Vespa Injects more into iconic range! The new Sachs Amici 125 has arrived in Australia. Sold throughout Europe and Asia as the Daelim Besbi, the Sachs Amici 125 has all the style and quality you may expect of a scooter worth a fair bit more then the $2290 + ORC asking price might suggest. We will have a full review of the new Sachs shortly but until then we can report that the Amici goes, stops and handles, all whilst offering amazing value for money. Oh and did I forget to mention it looks the goods also? 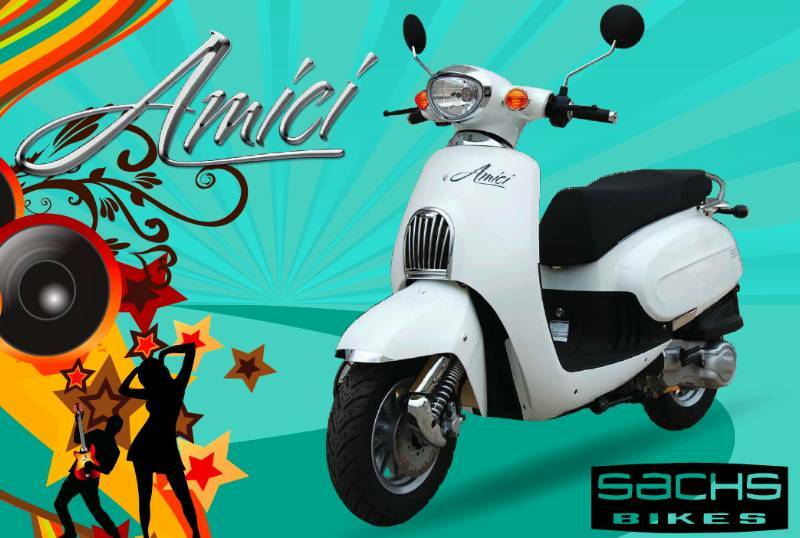 Bubbling with personality the Amici is your friend on the road. An iconic retro design supported by modern features and technology. Powerful chrome plated halogen headlight. Sleek integrated LED taillight assembly. Save time, money and the planet while having fun and travelling in style. The hardest part will be choosing your colour! Spring has sprung! 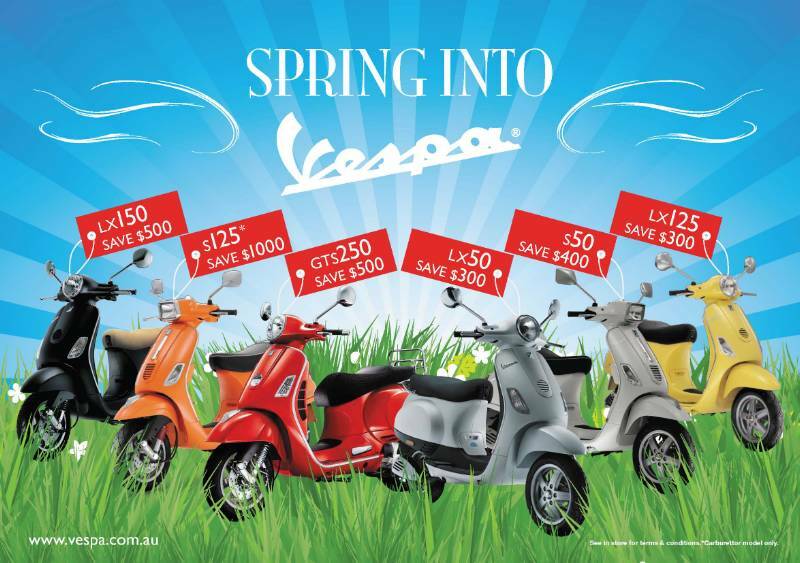 And to help celebrate, Vespa has got into the spirit with a saving of up to $1000 on 6 top selling Vespa Models. The current model LX 50, S 50, S 125, LX 125, LX150 and GTS 250 are all reduced to make your Spring a bright and cheerful one. The 60’s styled S 50 is at a very mod $3990** a saving of $400. 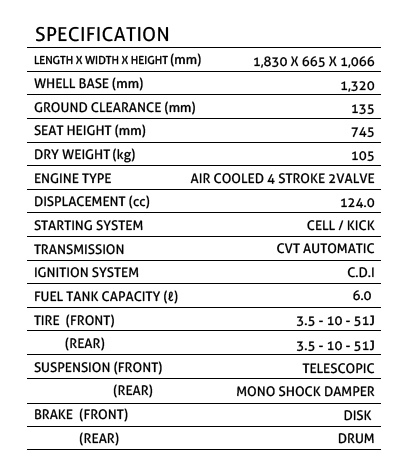 The LX 50 two stroke wonder, normally priced at $4290** is now just $3990** a saving of $300. For a bit more get up and go, you can commute in style on these two Vespa favourites. The LX 125 is normally $5990**, now just $5690** a saving of $300, and the trendy S 125 (Carby model) is at an amazing $1000 saving. If you are after even more go with your show, how about the LX 125’s big brother the LX 150 at $5990, a saving of $500. There’s never been a better time to get on an Italian icon! Offer Ends 1/12/2009 or while stocks last. **PRICES quoted are MLP (Manufacturers List Price). MLP is the component to which other components must be added to calculate a single or ride-away price. Components can include but are not necessarily limited to Registration, CTP, Stamp Duty, Dealer Delivery fee, Transport etc. Two new models in the Kymco model range which have been eagerly awaited by the public and dealers alike, have finally arrived in Australia. Next the sporty Super 8 125. An amazing sports scooter with a willing 125 cc motor and 14 inch wheels. 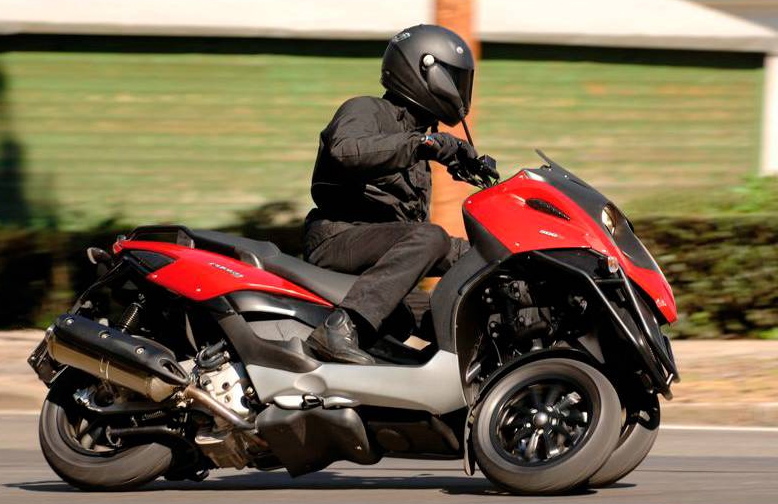 The Piaggio Group in Australia has just announced a temporary drop in the Manufacturers List Price (MLP) of the Gilera Fuoco from $13,990 to the new low of just $12,990. The Gilera Fuoco is at the top of the class when it comes to outright performance and handling. Blessed with the twin spark Piaggio Master engine, the Fuoco has an exceptional dynamic ability and of course exclusive looks. Efforts to prevent serious injury and death amongst motorcyclists and scooter riders have taken centre stage at Federal Parliament. Today I was joined by motorcycle enthusiasts from across the political spectrum as well as the National Press Gallery - Bradfield MP, Dr Brendan Nelson, Werriwa MP, Chris Hayes, and the Daily Telegraph's Malcolm Farr - to officially launch the Good Gear Guide for Motorcycle and Scooter Riders. The publication - an Australian first - provides riders with practical information about the safety gear they should be wearing every time they take to the road, setting out what to look for when shopping, the benefits of protective clothing and the injury risks posed to different parts of a rider's body. Every year more than 12,000 riders are hospitalised with serious injuries from both on- and off-road accidents. Many of these injuries could have been prevented or reduced in severity if riders had been wearing the appropriate gear. Our message to riders is a simple one: No matter what you ride - from scooter to superbike - good gear is an investment too important to ignore. It can make the difference between a nasty tumble and something far more serious. I urge all motorcyclists and scooter riders, especially new riders, to read the Guide and gear up every time they ride. A copy of theGood Gear Guide for Motorcycle and Scooter Riders can be downloaded from: www.infrastructure.gov.au/roads/safety. staggering result for only its third month of official trading in the Australian ATV market. July result by grabbing 3.2% of the Australian ATV market during August. Australia & New Zealand Chief Executive, Stuart McLean. backed up by strong warranty and a service-focused dealer network. of the year – the Kymco Sento 50 and Kymco Super 8 125.
delivering value for our customers and promoting the legendary Kymco riding experience. TOKYO, Japan, September 8, 2009 - Honda Motor Co., Ltd. announced that it has developed a new automatic transmission, the CV-Matic*, which can be used in combination with Cub-style engines. This new fully automatic transmission further enhances the practicality and convenience of the Cub-type models that have won fans worldwide, especially in developing countries. The new system will be available with Cub-style scooters to be released in the ASEAN region starting in 2010. The CV-Matic, features a new cooling system developed on the basis of Honda's small-motorcycle automatic transmission technology, which protects the drive belt from the high temperatures it is subjected to. This enhances the durability of the drive belt and allows for the more compact design with a shorter distance between pulleys. Thanks to this advance, the positioning of the engine does not need to be significantly altered, optimizing layout design freedom. TOKYO, Japan, September 8, 2009 - Honda Motor Co., Ltd. announced that it has developed the Dual Clutch Transmission*1, the world's first*2 fully automatic motorcycle dual clutch transmission for large-displacement sport bikes. The new transmission provides riders sporty riding enjoyment with easy operation, while its superior transmission efficiency delivers fuel economy equal to or better than a conventional manual transmission. A new VFR large-displacement sport bike equipped with the new transmission will be released in Europe and North America in 2010, with sales to commence in Japan at a later date. This world's first motorcycle dual clutch transmission features a light, compact design that allows it to be combined with existing engines without substantial layout modification. Further, the new transmission delivers the precise acceleration control riders require thanks to electronic control technology that helps ensure smooth, seamless gear changes. In order to respond to rider demands in a broad range of situations, the transmission is equipped with three operating modes, two full-auto modes (D-mode for regular operation and S-mode for sporty riding); and a 6-speed manual mode, which delivers the same shift feel as a manual transmission. Honda intends to gradually expand the deployment of the new transmission to more and more of its large-displacement motorcycles, particularly sports models destined for use in developed countries. Honda will continue to deliver motorcycles that match the needs of society and users' lifestyles, spreading the joy of riding and mobility. The new transmission features a dual clutch transmission configuration in which independent clutches are employed for the odd gears (1st, 3rd, 5th) and the even gears (2nd, 4th, 6th), respectively. The two clutches operate alternately to effect gear changes. For example, when changing from 1st to 2nd gear, the computer detects the up-shift and engages 2nd gear, then releases the 1st-gear clutch while engaging the 2nd-gear clutch to achieve a seamless gear change. While some dual-clutch transmissions tend to be bulky, the new system employs original technologies such as dual input shafts, exclusive in-line clutch design, and concentration of hydraulic circuitry beneath the engine cover to achieve a compact design. Compactness and lightness is further enhanced through the use of a simple shift mechanism design based on that of a conventional motorcycle shift drum. Optimized shift scheduling achieves fuel economy equal to or better than that of a fully manual transmission, enabling Dual Clutch Transmission to deliver both sporty riding and environmental performance combined. Honda Australia Roadcraft Training (HART) is celebrating a highly successful 10 years of operation within the local St Ives, NSW community by inviting the public to come along to an open day on Saturday, September 26th from 9 am to 4 pm. For the past decade, HART has been delivering low-risk, hazard perception based training to thousands of drivers, riders and school students. Everyone participating in the event activities will go into the draw to win prizes provided by the major sponsors including free driver and rider training courses, Teknic jacket and gloves from Sydney City Motorcycles, a pair of Draggin Jeans and other Draggin products, Wiley X sunglasses products, a set of Michelin tyres from Wayne Gardner Enterprises to the value of $500, and more! Highlights of the day include free "Try It" sessions for beginners and experienced Riders, as well as free demo rides of the Honda road fleet, Riding Simulator sessions conducted by senior HART instructors, protective clothing available for purchase at discounted prices, rider and driver activities, and demonstrations from a number of road safety experts. Anyone who books and pays on the day for a Post Learner, Handling Dynamics or Advanced rider training courses will receive $50 off. Further highlights include a sausage sizzle by local scouts, jumping castle for the kids and exhibits by NSW Police, NSW Fire brigades, NSW Ambulance and NRMA. HART has long been considered a preeminent provider of rider and driver training in New South Wales, and boasts a two kilometre closed road circuit allowing for both novices and experienced riders and drivers to obtain realistic road speeds in a controlled situation. This combined with both dedicated on and off road training ranges makes it a unique training facility in NSW. "We are thrilled to be celebrating 10 years of operation in NSW," said HART National Manager Mark Collins. "This is one of the best rider/driver training complexes in Australia with a road circuit, training ranges and low speed manoeuvring areas. We aim to fully utilise these areas by delivering industry leading courses." The Open Day will take place at 451 Mona Vale Road, opposite the St Ives Showgrounds, from 9 a.m., with formal proceedings taking place at 11 a.m. Further enquiries, please phone 02 9144 5725.